Douglas has taken to observing and imaging since being bought a 4" achromatic refractor a few years ago. He currently uses both an SLR and a webcam to capture his images. Please visit his website here. Wispy cloud tries unsuccessfully to block the view as the 'black spot' of Venus heads for 4th Contact during it's egress from the face of the Sun. 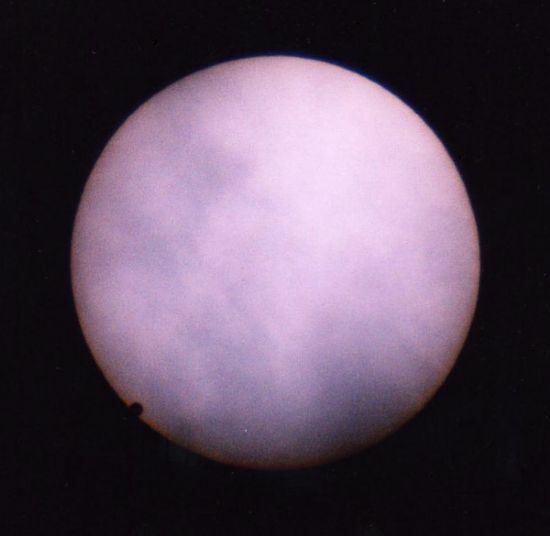 Taken at approximately 12:05 using a Canon EOS300 film-based SLR through solar filter-equipped Helios 4" f10 refractor. Exposure time 1/500 sec. 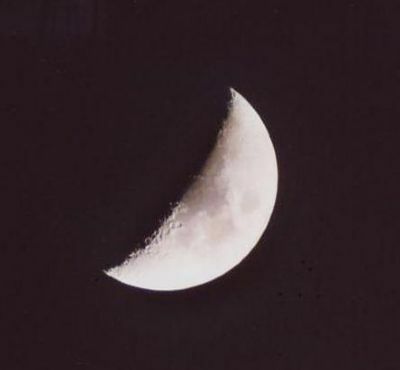 Taken with a Canon EOS300, 1/150th sec exposure, through Helios 102 refractor. 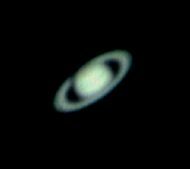 Image of Saturn taken in the spring of 2005, using Helios 102mm achromatic refractor and Tuocam Pro II. Taken from 140 stacked images, processed in Registax. The Apeninne mountain range on the edge of Mare Imbrium, with Archimedes (83km) to the left, Aristillus (55km) to its upper right, and Autolycus (39km) below it. Philips Tuocam Pro2 webcam at 10 frames per sec. Registax 3 used to stack best images. The large crater Plato (101km) dominates the Northern end of the Mare Imbrium. Immediately below is the isolated wedge shaped Mt. Pico (2400m), to the left of which run the Teneriffe Mountains. The angle of the Sun's illumination has nicely picked out the Straight Wall, just beyond the Teneriffe range. At the end of the curved landscape is the Laplace Promontory (2600m), above which are the craters Maupertuis (50km) and La Condamine (40km). 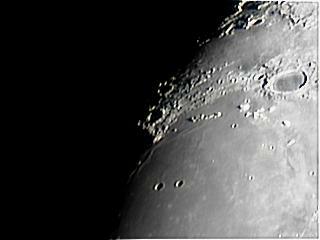 Mare Frigoris can be seen above Plato with the distict crater Fontenelle (40km) with its 1750m high walls. 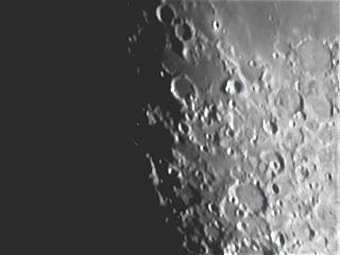 The two craters in lower centre of picture are (L-R) Helicon (21km) and Le Verrier (18km). Both of these craters feature high walls of 2250m and 2450m respectively. Philips Tuocam Pro 2 webcam, Helios 102mm refractor. Frames stacked with Registax 3. Crater Stofler and surrounding craters in the jumble of the central Southern Highlands. Stofler (126km) is the large flat-floored crater to right of centre, with later crater Faraday (70km) intruding from the lower right. Above Stofler is large crater Walter (140km) slightly cut off by the top of the pic. 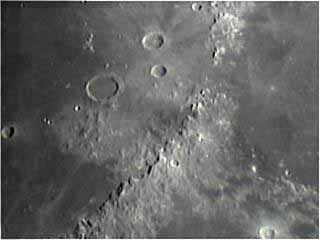 The lunar terminator is running along craters Saussure, Huggins, Miller and others to the left of the pic. Stofler has seen a lot of damage since being formed, having been marked by many smaller, later impact craters. The latest is thought to be the small dark one on the very edge of Stofler (18km). Philips Tuocam Pro 2 webcam, Helios 4" f10 refractor. Frames stacked with Registax 3. The area southwest of Palus Epidemiarum, or The Marsh of Epidemics. 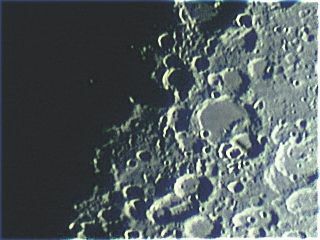 The large flooded crater at top right is Pitatus (97km), and below are the eroded craters Wurzelbauer (88km) to the left and Gauricus (79km) to its right. Left of Wurzelbauer, half way to centre of the image, the small half-illuminated crater with the tiny craterlet on its rim is Cichus (41km- the tiny craterlet is a mere 11km across), and another jump to the left takes us to the mare-filled crater Capuanis (60km) just above centre of image. The old, eroded crater at bottom right is Wilhelm (107km) with the smaller craters around the southwest rim evidence of later impacts. Helios 102mm f10 refractor, Tuocam Pro 2 webcam, frames stacked in Registax. This image was taken at Brodgar overlooking the Harray Loch, close to the World Heritage Neolithic site, the Ring of Brodgar. 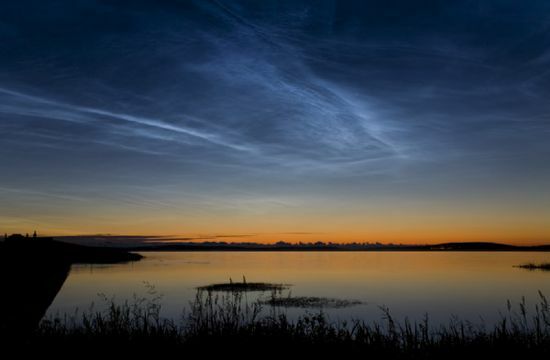 It was taken at 11.58 pm on the 20th of July 2007, with a Canon 5D 17-40lens at ISO 100 and a 13 second exposure at f/14.